It was a busy Saturday at Ballymena United Youth Academy with the clubs mini soccer off to a great start on a mild and sunny autumn morning. The 15s and 14s were both in action at the Showgrounds as well, the 14s disappointed to lose out in the opening derby of the season to Carniny. In a seven goal thriller Gary Twigg’s under 15s put on a great show before losing out narrowly to Foyle Harps. The senior under 16s were in action at the Waveney and were also frustrated to come away with nothing after leading their game with Ridgeway. The 17s had a better night on Friday recording a 6-2 success away to Ballymoney. Lisburn Youth U-12 v BUYA U-12: BUYA u12 completed their inaugural Lisburn League fixture against a quality Lisburn Youth team on Saturday. They showed character to come back into the game and totally dominated the second half and goals from Joshua Balmer and Adam Millar were taken with composure. BUYA U-13 1, Cliftonville 3: Defeat was tough to take for these boys who missed a hatful of chances on the night and were made to pay in the end with a couple of defensive slips. United’s goal was a well placed free kick from Blake Douglas. BUYA 0, Carniny Youth 2: Derby honours went to a hungry reds side who outfought the sky blues on the day. BUYA 3, Foyle Harps 4: After going a goal down a Sean McKay penalty squared matters. United went ahead in the 27th minute with a good effort from Conleth McGuckian. On 36 minutes it was 2-2 and the North West side edged ahead on 39 minutes with a penalty themselves. Jonny Patterson fired the Skies level once more in this topsy-turvy affair only for Harps to edge the winner soon after. Ballymena United U-16 1, Ridgeway Rovers 3: The Sky Blues took the lead in the second half when Jack Millar’s sot came off the post and Josh Galloway fired home the rebound. But Ridgeway equalised in freak fashion when a long wind-assisted clearance by the keeper bounced in and the Belfast side followed this up with two more goals. Ballymoney United U-17 2, Ballymena United U-17 6: Ballymena got off to the perfect start when Michael McCabe volleyed home a Thomas Campbell cross and it was 2-0 when Jamie Houston put Jack Walshe through on goal. Neat play down the left between Isaac Dunne and Jack Walshe released Sam Millar who slotted past the goal keeper. Just before half time Ballymena scored their fourth when Sam Millar reacted quickest to a loose ball in the box to score his second of the game. Good link up play down the right between Thomas Campbell and Luke Stockman released Adam McClelland who fired home. 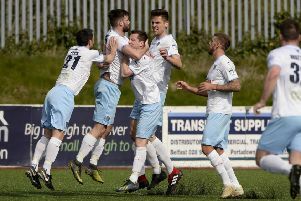 Ballymena scored their sixth when Jack Walshe released Luke Stockman to score before Ballymoney scored two late goals.